On May 9th, after my awesome day at the Fitness Magazine's Meet & Tweet, I got to meet the ladies behind Tone It Up! Hi Karena and Katrina!! Been a follower of their YouTube videos and their brand for over a year now and I live how inspirational they are. Their workouts are so so fun and effective in toning! They had Spring into Bikini Series last year and they're doing it again! If you haven't signed up yet, check out their site toneitup.com and join them on Facebook, twitter or their community! 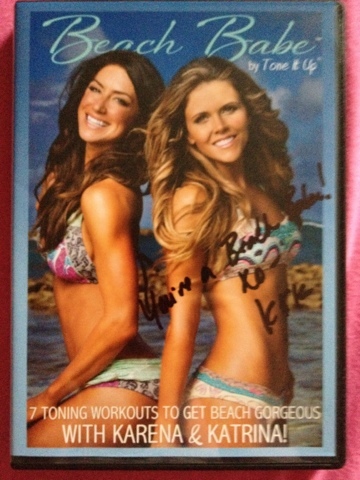 As an early bird, I also got a signed copy of their Beach Babe DVD! They were incredibly nice and had such a groupie moment! Took a picture with them and left with smiles on my face!